NO. SO (CA) 1-40/2008 government of the Punjab higher education department Dated the 22nd Nov 2018 regarding International Relations Degree and BS English NOC for Punjab College University. Subject NOC TO START BS ENGLISH FOR 2nd SHIFT AND BS International Relations for Morning Shift. Please refer to the subject noted above, it is directed to state that the Government of Punjab. 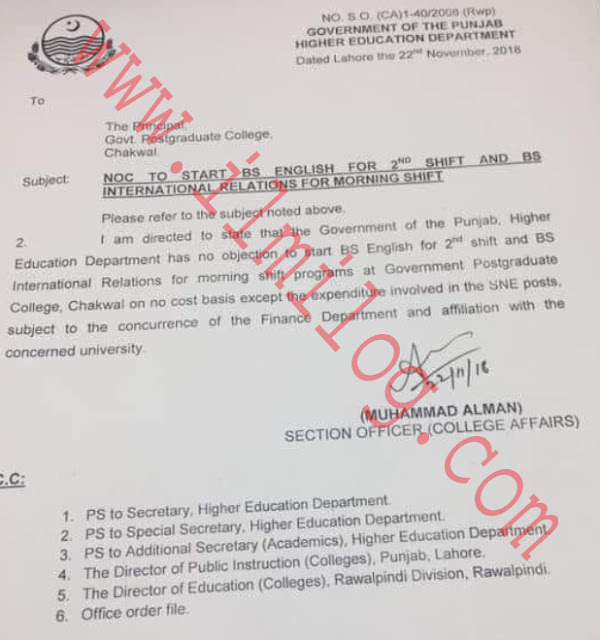 Higher Education Department has no objection to starting BS English for 2nd shift and BS International Relations for morning shift programs at Government Postgraduate College. Chakwal on a no-cost basis except the expenditure involved in the SNE posts. Subject to the concurrence of the Finance Department and affiliation with the concerned university. 1. PS to Secretary. Higher Education Department 2. PS to Special Secretary, Higher Education Department 3. PS to Additional Secretary (Academics), Higher Education Department 4. The Director of Public Instruction (Colleges), Punjab. Lahore. 5. The Director of Education (Colleges). Rawalpindi Division. Rawalpindi 6. Office order file.